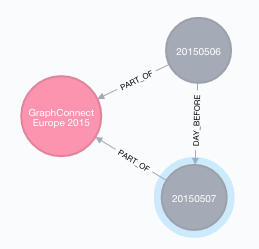 Next month is GraphConnect London, our industry's yearly High Mass of Graphiness. It's going to be a wonderful event, and of course I wanted to chip in to promote it in any way that I can. 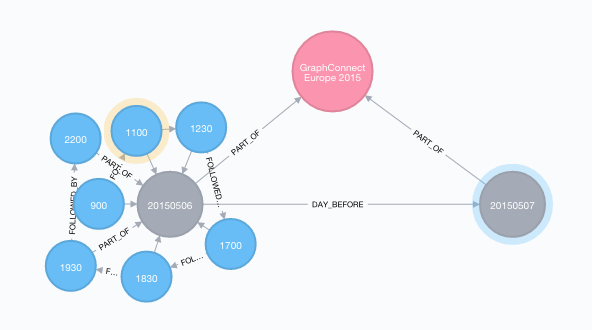 So I did the same thing that I did for Øredev and Qcon before: importing the schedule into Neo4j. I actually have already published an GraphGist about this already. But this post is more about the making of that database - just because I - AGAIN - learnt something interesting while doing it. 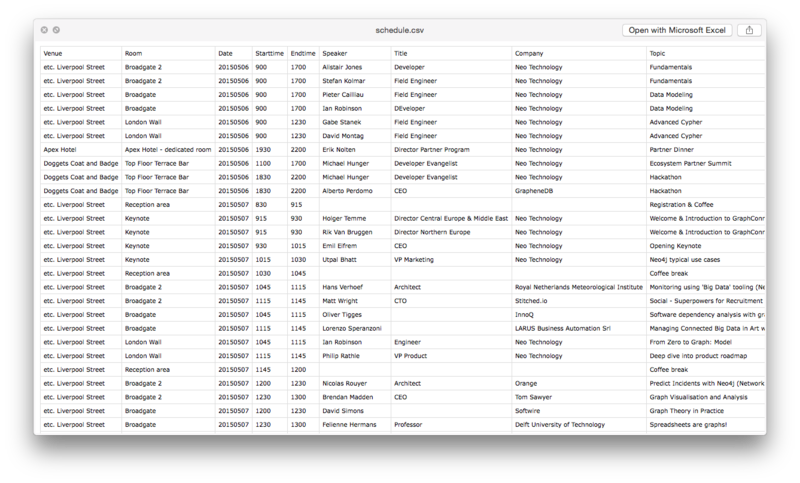 I have shared the CSV file on Github. Nothing really special about it. But let me quickly explain what I did with it. The right hand part is probably pretty easy to understand. But of course I had to do something special with the days and the timeslots. So how to import into that from that simple CSV file. Let's explore. but creating the appropriate FOLLOWED_BY relationships between the timeslots to create the in-graph index/timeline, is not that easy. you match all the timeslots that are part of the specific day that you want to order. And that's it. Job done. We do this for the second day ("20150507") as well, of course. Hope you enjoyed this as much as I did, and hope to see you at the conference!